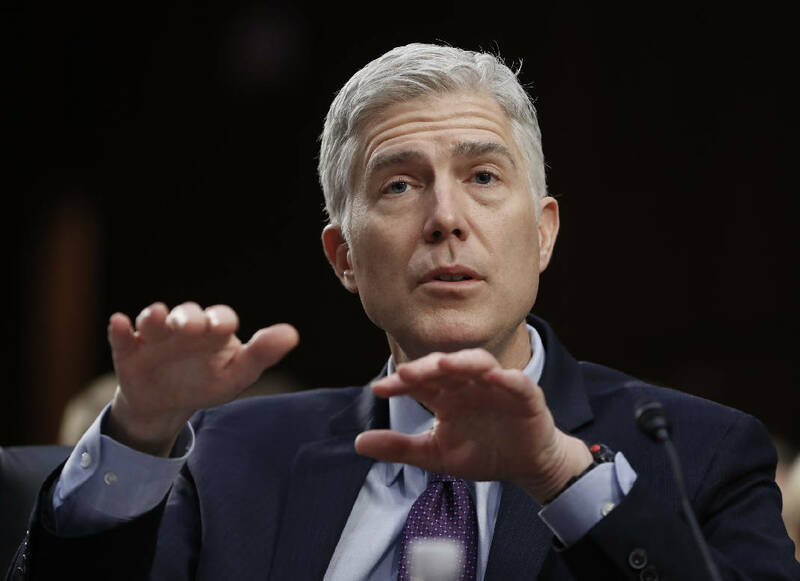 WASHINGTON (AP) - Supreme Court nominee Neil Gorsuch enters the third day of his nomination hearings largely unscathed by Democratic attacks, as Republicans confidently predict he will win confirmation despite liberal opposition. A growing number of Democrats, including Senate Minority Leader Chuck Schumer of New York and Sen. Elizabeth Warren of Massachusetts, are calling for Gorsuch's confirmation to be delayed because of the FBI investigation of ties between Donald Trump's presidential campaign and Russia. But Judiciary Chairman Chuck Grassley of Iowa dismissed that demand as "ridiculous," and Senate Majority Leader Mitch McConnell of Kentucky told The Associated Press: "Gorsuch will be confirmed. I just can't tell you exactly how that will happen yet." Even with Democrats divided over how hard to fight Gorsuch's nomination, the political intensity accompanying his confirmation process seemed at times palpable during the second day of hearings Tuesday, as the questioning stretched beyond 11 hours. Democratic Sen. Richard Blumenthal of Connecticut announced he would be asking Gorsuch about the "elephant in the room" - Trump - and tried to draw him out over Trump's attacks on judges, including those who halted his immigration travel ban. "When anyone criticizes the honesty and integrity or the motives of a federal judge, I find that disheartening, I find that demoralizing," Gorsuch said. "Including the president?" Blumenthal said. It was the first time Gorsuch had said publicly what he had told senators, including Blumenthal, in private meetings in recent weeks. Gorsuch's exchange with Blumenthal also yielded the surprising revelation that Trump had used a private interview with Gorsuch, prior to nominating him in January, to muse about having lost Colorado in the presidential election and argue that he would have won the state if given more time. Gorsuch serves on the 10th U.S. Circuit Court of Appeals in Denver, and would fill the 13-month vacancy on the high court created by the death of Antonin Scalia last year. Gorsuch, who will face additional questioning from senators Wednesday, made two other notable statements in response to questions from members of the Judiciary Committee, and both also related to Trump, who nominated him. And when Vermont Democratic Sen. Patrick Leahy asked Gorsuch if a president is free to ignore laws on national security grounds, Gorsuch replied that "nobody is above the law in this country, and that includes the president of the United States." Still the day was mostly devoid of drama as Gorsuch swatted away Democrats' efforts to get him to reveal his views on abortion, guns and other controversial issues, insisting he keeps "an open mind for the entire process" when he makes rulings. There are now just eight justices on the nine-member high court. There have been a number of 4-4 ties and Gorsuch, a highly credentialed conservative who is ideologically akin to Scalia, would be expected to join the bloc of largely conservative justices. The confirmation hearing will wrap up with a panel of outside witnesses talking about Gorsuch, before a committee vote expected April 3 and a Senate floor vote later that same week.